It all started in 2007 at Progpower festival, when Floor and Jorn shared the stage together for an all star jam. Back then, they found cohesion and a great share of creativity playing with each other. They unified their forces to build a strong team of hard rock .They wanted to rock without the multi-layers of keyboards and stuff, and they wanted the rock extra strong and mostly basic working with the roots and with an "in your face" attitude. They did it quite well. 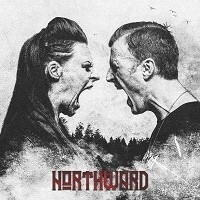 Eleven years passed between the idea and creation of NORTHWARD and the delivery to the fans. After a NIGHTWISH break in 2017, Floor took this opportunity to contact Jorn and asked him to bring back this project. The answer was YEAH! Released by Nuclear Blast Records, it's just a matter of time and fans will enjoy it. The first track "While Love Died" doesn't take time to deliver. The first seconds already are filled with a fast riff and Floor's already warmed up too sing out loud. Great energy! This first track (and first single too) is greatly moving and positively overwhelming. Jorn's guitar work and solos are exciting and and really entertaining. For liking his work in PAGAN'S MIND, I knew it was a winning choice already. Wow one song done and I want more! "Get What You Give" is more rhythmic, and offers harmonic vocals. The chorus is powerful, and there are great acoustic passages that can be heard, kinda like "gypsy" playing. It's very interesting to hear to hear Floor sing differently. She's a beast of a woman, and a monumental vocalist. In this song we have a great demonstration of her versatility: hard as a rock or fluid like a waterfall. "Storm in a Glass" is showing an 80's feel. Not that much of an original song but it's pretty good. The vocal arrangements are the strength of this one. The vocals are on the foreground, guitars and bass acting as secondary roles. "Drifting Islands" has something special as we can hear two sisters together. In fact, Floor sings with his sister Irene and it's quite cool to hear them together. I like it. They blend quite well. A nicely done solo and great rhythmic guitars are heard through the song. "Paragon" is a break to distorted guitar. It's an acoustic one, with light reverb, and is guitar driven. Then the chorus brings back electric guitars back. It's a back and forth playing between light passages and more energetic ones. This song is amazing. It cooks the listener with a nice progression. The song structure is more elaborated here. The solos are incredible, and once the peak and the sum is reached, they're done. "Let Me Out" as the same approach as "While Love Died" and could have been used as an opener too. This one is a sincere… a from the heart shout. Once again Jorn shows his nice skills doing some solos in the right moments or making his guitar cry rhythmic and powerful chords. "Big Boy" is a breakdown fest and the drums are really dynamic. This one is great for dancing. You cannot stand still. "Time Bomb" ala Zakk Wylde playing for the first 15 seconds or so then all of a sudden its a piano filled track with floor and vocal harmonies singing (quite a weird transition I must admit). Then the chorus is reached and the guitar is back and also the keys that we didn't hear that much for now. There is a strong chorus and singing, with a really nice Gilmour solo. "Bridle Passion" has acoustic guitar and Floor in her purest form. It's truly a beautiful song, with her charming voice. Her raw and pure talent can also be pure as a crystal. "I Need" is fast paced, with great drumming. This one is for driving or riding or extreme toe tapping. "Northward" as an electronic intro filled with acoustic guitar. Floor sings softly, showing her flawless singing once again…angelic like. After a minute the intensity grows, showing a cool dose of energy and inviting us to more soft passages to let us finally find and end to this monstrous demonstration of talent, overflowing creativity and all good things must end…unfortunately.